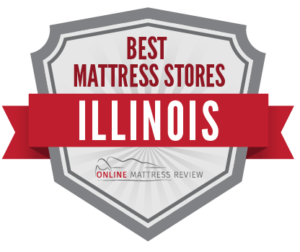 In this article we’ve narrowed down some of the best mattress shops in the entire state of Illinois, focusing primarily on the ones in larger areas. There are no shortages of great mattress options in the Prairie State. Whether you are living back to back with St. Louis, situated in the smaller cities in Illinois, or have found your home in the great city of Chicago, we have got you covered when it comes to mattresses. Mattress options in Illinois are as diverse as the state is large with everything from custom build king-size mattresses to single beds perfect for your small studio in Chicago. In today’s market, you can pay as little or as much as $200-$40,000 for a mattress. Yes, some people see this investment as important if not more important than purchasing a car. But whatever your budget, Illinois has something for you. If you’re looking for chemical-free there are a number of shops that custom build not only to size and shape but with sustainable organic materials in mind. Check out our individual city pages within the state, or a run down of mattress store offerings by region below. There are a number of fantastic options for a mattress in Chicago. Whether you’re looking for something organic, discounted, or something in a hurry, Chicago has quality and affordable mattresses to meet your specific needs. For a quality mattress fast, we recommend checking out Epic Sleep Mattress (2822 N. Halsted St.). Epic Sleep Mattress is known for their fast and efficient customer service, quality products, and accommodating delivery services. For more of a mom and pop mattress shot, try Sleep City (3154 Clark St.) Sleep CIty offers, a calm clear shopping experience that leaves you walking away with the mattress that you need and fits your budget. They even offer free delivery and free disposal of your old mattress. There are two other locations. College students rejoice- you can find an affordable mattress at Chicago Cheap Mattress (4140 N. Kedzie Ave) located in Irving Park. There is a Mattress Overstock in Lombard for those who are looking for a mattress near Chicago. Mattress Firm does a great job supplying each neighborhood with a place to shop around. You will find them in University Village, Edgwater, Firm Gold Coast, Lincoln Square, Irving Park and more. For a neighborhood mattress shop that does it all -even custom builds, SleepRite Bedding (6206 N. Broadway) is a great option. Their customer service is outstanding, and they run like a small local business- very personalized and true to their word. Have you ever wondered- where can I find a mattress in Springfield? We have you covered, as there are a number of options for Springfield residents and those who are looking for a mattress near Springfield. Sam’s Best Brands Plus (3101 Lindbergh Blvd.) provides honest customer service, fair priced mattresses, and accommodating delivery options. Verlo Mattress Factory (3308 Robbins Rd.) is a fantastic local mattress shop that custom makes beds to fit your sleep style and budget needs. This is a small locally run mattress shop in Springfield. If you are looking for a mattress store in Peoria, try Lebeda Mattress Factory (4650 Brandywine Dr.) for affordably priced mattresses, and a courteous and knowledgeable staff. Mattress Firm provide mattresses in downtown Peoria as well as across the river in East Peoria. If you are looking for a mattress shop in Champaign, you may want to try Illini Mattress Company (514 S. Country Fair Dr.). They offers a wide range of mattresses for every budget. They will even accommodate custom build requests. Other great options in Champaign include Mattress Boss, and Mattress Firm Champaign. When in Decatur, you may want to check out Slumberland Furniture (265 East Ash Ave) for all of your mattress needs. For the purposes of this write up, we are also including St. Louis for Southern Illinois as we understand that a number of people use St. Louis as their place for making quality purchases. For those living near St. Louis, Meyer Bedding & Mattress Co (4801 Potomac St.), The BedGuy (6431 Hampton Ave) and Preferred Mattresses ( 3326 Watson Rd), are all located closest to the state line. Preferred Mattresses offers a wide range of mattress option, in-home assembly and quality customer service. If you are wondering where you can find a mattress shop in Mount Vernon we recommend checking out Steffy Home Furnishings (700 S. 42nd St.) for great customer service and personalized quality attention. If you are looking for a mattress near Marion, we found a few spots like the Mattress Firm Clearance (1330 E. Main St.) in Carbondale. Or you may want to check out Bryan Furniture (213 N Park Ave) in Herrin. Bryan Furniture supplies quality mattresses, great customer service, and home delivery.